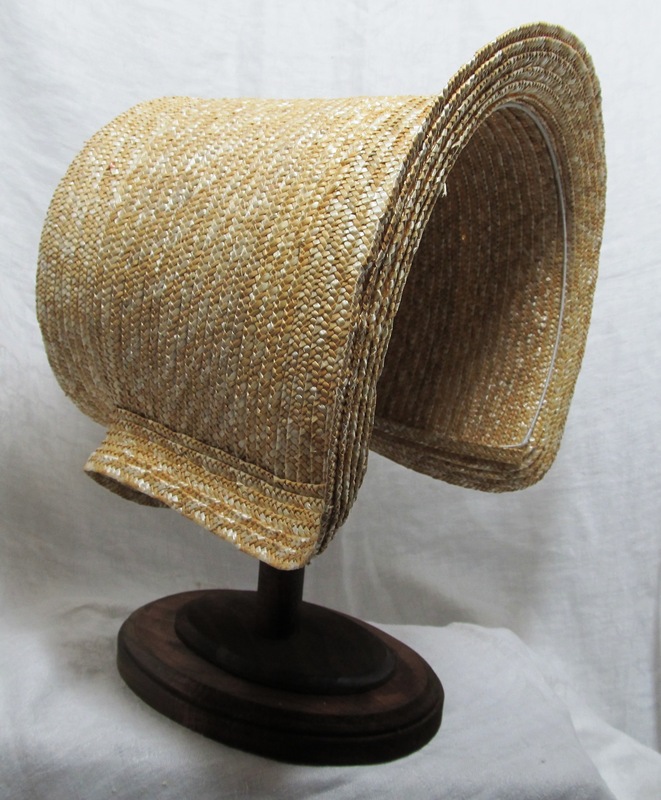 What Does a Milliner Do…. ….When it is two days before an event in a new to her era…. ….. and she discovers she has no bonnet of her own for that era???? Yes. There is a moment of panic. A bit of a background… I finally got around to making a Regency era dress. Actually, it is a late Regency dress, 1820ish with a cross-over bodice. Two Saturdays ago, Bevin asked me if I wanted to come out for GCV’s War of 1812 and Jane Austen weekend to demo working with straw plait. Of course I did. I had a dress. I had straw. All good. Yep, that was wedding brain mixed with end of the year brain. Not all good. There are details. Those details started sinking in Wednesday evening before the event as a thunderstorm was rolling in. Bonnet. Ribbons. Shoes. Jewelry. Carry in. At least I had started two demo pieces, one bonnet and one hat. 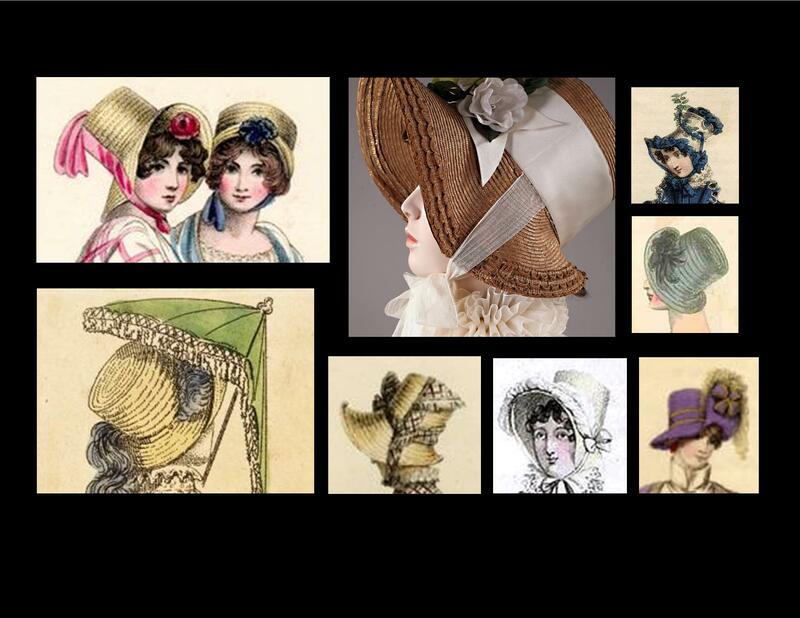 This (left) is the of the two types of bonnet I really want to wear this weekend. But, I sorta gave each of them a new home already. 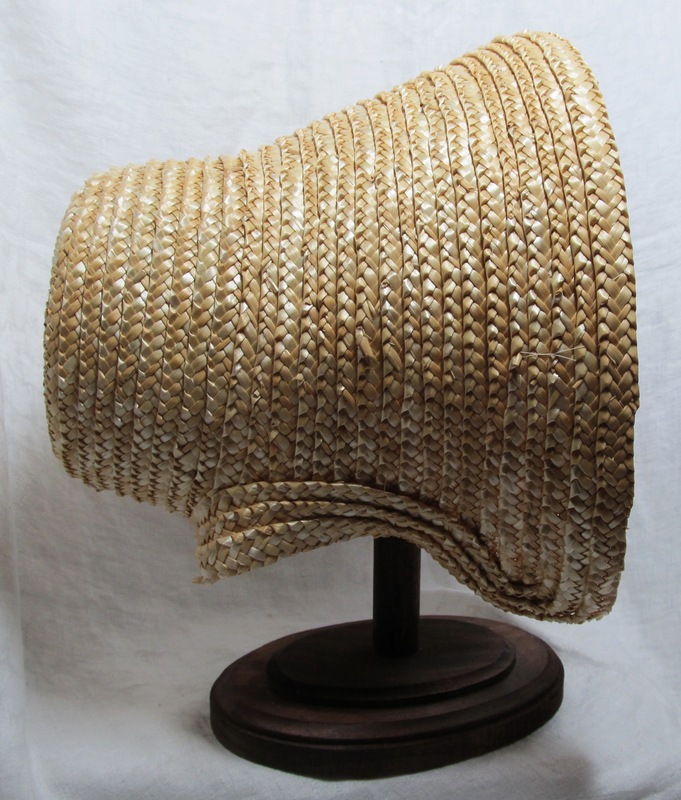 Alas, it will have to be the plait and gold silk bonnet I made over a decade ago. I shifted the one pile in the sewing room to get to the shelf with the totes of the bonnets…. 50s. 50s. 40s. next…. 50s, 60s, 60s, …. next…. Ack!!!! It is not in the house. It is in the depths of storage. This is a problem. The choices become a) Make a new bonnet in two nights with very humid weather. b) Drive to storage, dig through in hopes of finding the misplaced bonnet. c) Pull the Romantic era from the shop, decorate it and make-do. d) Pull the tall crown hat from the shop, reshape the brim and decorate it. Mind you, this is in the midst of dealing with the most exhausting time of the year at school while helping balance out for and worrying about a couple very ill coworkers. I decided to go with choice d…. 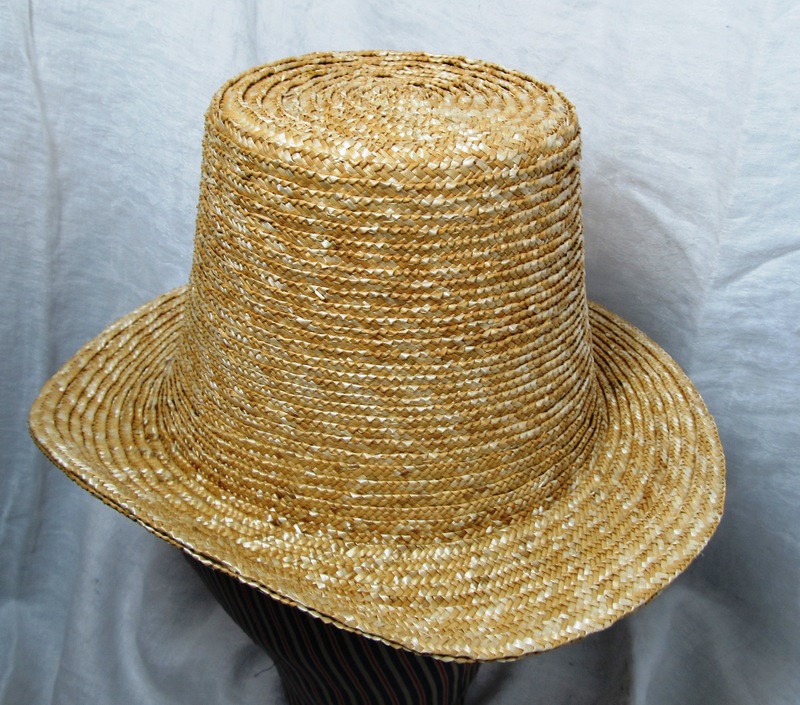 This is the hat that is getting reshaped…. These are the inspiration images for the reshaping and the decorating…. Good luck! I hope you get it done in time! Joy always tells me it’s the cobblers children that go without shoes…..